FBN’s Diane Macedo on the future of the loan provider. Student loan company Sallie Mae (NASDAQ:SLM) on Wednesday announced plans to split into two companies and promoted Chief Operating Officer John F. Remondi to chief executive, effective immediately. Shares leapt 13% to $26 and are up about 34% on the year. The restructuring will create two separate, publicly traded companies: a education loan management company and a consumer banking business. Remondi, who was president and operating chief since 2011, will serve as CEO of the education loan management company once the separation is completed. 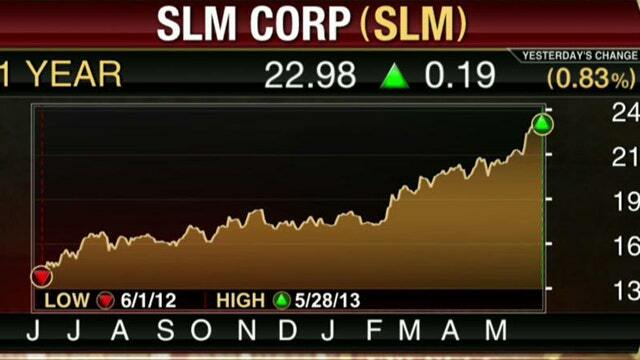 Sallie Mae, the largest private student lender, said current CEO Albert L. Lord is moving up his plans to retire. In 2010, the U.S. ended a program that let organizations like Sallie Mae originate federally guaranteed student loans, although Sallie Mae still has a large portfolio of those FFELP loans. The education loan management business will own 95% of Sallie Mae’s assets, including about $118.1 billion in FFELP loans, $31.6 billion in private education loans, $7.9 billion of other interest-earning assets and an education loan servicing platform that handles federal education loans for about 10 million customers. The consumer banking assets will likely total $9.9 billion, mainly from private education loans and related services and platforms, as well as Sallie Mae’s Upromise rewards program. Joseph DePaulo, the company’s executive vice president of banking and finance, will serve as CEO of the new consumer banking company. DePaulo joined Sallie Mae in 2009 as executive vice president and chief marketing officer. Last month, Sallie Mae reported first-quarter earnings that tripled amid a smaller loss on derivatives and a gain related to a recent sale.